Worked today with amazing kids Aiden, Valentina, Noah, etc. and then did a super clean sweep of my room--I am now able to see the floor of my closet. Tonight, celebrated Jacque's birthday at Star Pizza which was delicious and she absolutely LOVED her present from me//bacon air freshener, cupcake floss, & giftcard. 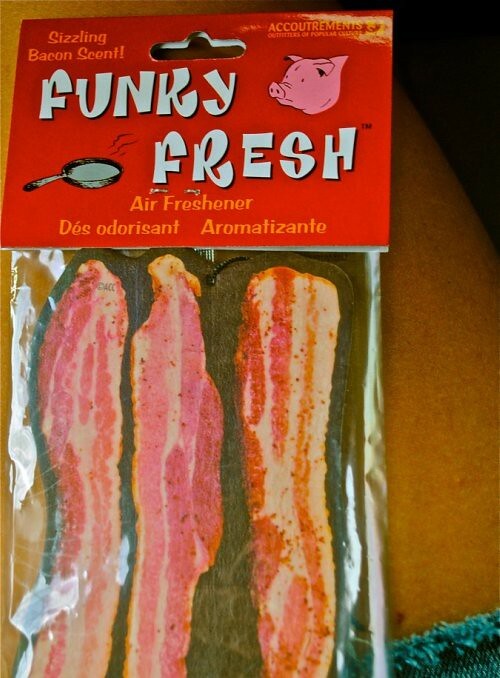 Haha oh the bacon freshener is def going to attract some hotties to her car. Rewind to a few days, I feel like I may have slighted you all in terms of the Gaga post. I hope you enjoyed the pictures, but true, the details were a little lacking. Concert quality--five hundred golden starrrs. Gaga did over a dozen outfit changes, and played all her top hits: Alejandro, Bad Romance, Paparazzi, Monster, Teeth, Dance in the Dark, Poker Face, Boys Boys Boys, etc. She preached equal rights for members of the LGBT community and promoted self-love, promising freedom for her little monsters in attendance. Everyone was dancing with their paws up, true little monster style, and some of the outfits worn by fans were absolutely ridiculous like straight up lingerie. As far as my outfit, yeah I looked kinda like an 80's Barbie doll. BUT my fabulous dress was from Value Village for an absolute steal. I actually got the dress hemmed which cause over four times as much as the dress itself. Leggings - $10 from Urban Outfitters. Shoes originally purchased for prom. Earrings from mother's closet. Hair & makeup both done by the lovely mother. Dressing up was truly almost as much fun as the actual concert. Overall, Kylie & I loved dancing in the dark as little monsters monday night. We saw the Madonna of our time and it was glorious.